Testimonials: No matter what kind of cancer you got, please don’t easily give up and keep it in mind that it is very important to choose your treatment plan. DEDI IRWAN SUGIANTO is from Surabaya, Indonesia. He has a perfect family that is full of happiness: a wife who loves him and three lovely children. However, in the earlier 2012, his neck became enlarged, which made the family start panicking. He told us that he found lumps as big as dates but without pain in his anterior neck in March 2012. Every afternoon, he had body fever but could recover by itself. He totally ignored these symptoms since they did not have a big effect on his life. Until July 2012, the lump became bigger and bigger then he realized that something might be wrong and went to the local hospital for checkup, which turned out that he was diagnosed with Hodgkin's lymphoma. The local doctors suggested chemotherapy but DEDI IRWAN SUGIANTO refused it because he noted that it has huge side effects. Later, he was trying some oral herbal medicines but it turned out even bad effect with the lump increased rapidly. At the same time, they were trying to figure out an alternative treatment. After making inquiries, they knew about Modern Cancer Hospital Guangzhou which can treat cancer with advanced minimally invasive technologies which contains small trauma, fewer side effects and with quick recovery. After comprehensive consideration of various factors, he decided to take treatments in Modern Cancer Hospital Guangzhou. In June 2013, DEDI IRWAN SUGIANTO came to Modern Cancer Hospital Guangzhou for the first time. At that time, his neck was even bigger than his head and could move it hardly. After a full evaluation, the lump in his left and anterior neck was about 25*15 cm, which was diagnosed as Hodgkin's lymphoma stage IV. According to DEDI IRWAN SUGIANTO’s diagnosis and his current condition, MTD team in Modern Cancer Hospital Guangzhou had made up a comprehensive treatment plan, mainly contained interventional therapy. For interventional therapy, performed under imaging guidance, such as CT and ultrasound, it is required to make a 1-2 mm incision on patient’s body (usually in the groin), from which a tiny tube-like device is inserted into the artery. This tube stretches within the artery carrying anti-cancer drugs until it reaches the cancer area. Right in the cancer area, anti-cancer drugs will be released. At the same time, tumor and its blood offering artery will be blocked so that the tumor would starve to death. Before undergoing the treatment, DEDI IRWAN SUGIANTO was so nervous and worried so much about the treatment effects. He was relieved after doctor’s carefully explained and comforted. 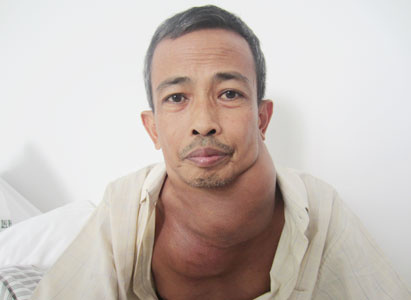 After a series of treatments, his neck generally became smaller and then the tumor disappeared. At that time, he was fully relieved, starting smile again and accept the following consolidation therapy positively. He said he could hardly feel obvious side effects during the treatment; rather, he had a good sleep quality and appetite. Now, after 3 years, he is in stable condition and his life and work are return to normal. After work, he is enjoying drawing which can help him relax. Last but not least, he wants to share his attainment with us: No matter what kind of cancer you got, please don’t easily give up and keep it in mind that it is very important to choose your treatment plan.